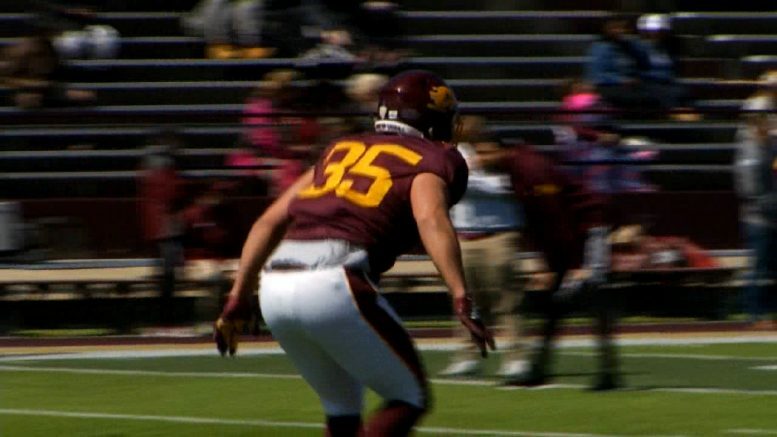 Mount Pleasant, Mich. — The Central Michigan Chippewas held their spring open practice on Saturday, April 13, and Alpena’s Logan Guthrie took part under new CMU Head Coach Jim McElwain. Guthrie will wear number 35 as a freshman. The Chippewas’ linebacker room will need some fresh young blood after losing three key seniors, Malik Fountain, Alex Briones and Trevor Apsey. Those three contributed 33.2 percent of Central’s tackles. Senior Michael Oliver has the most experience right now, but he needs to take over the leadership role for the unit to flourish. Last season, Oliver put up 31 tackles, two tackles for a loss and one sack. Plus, he started six of 11 games. There are a few other linebackers, such as redshirt sophomore Troy Brown, redshirt freshman George Douglas, senior Christian Mercer, redshirt sophomore Andrew Ward, redshirt freshman Chuck Jones and redshirt freshman Nick Apsey. There are two spring newcomers to the group, Guthrie and Justin Whiteside. Guthrie left Alpena in January for early enrollment at CMU, and since then he has bulked up and is now considered for the middle linebacker position. Guthrie weighed in at 218 pounds and now is up to a solid 240. During his career at Alpena, he topped the career rushing record with over 2,700 yards and tied the Wildcat’s record of 27 tackles in one game.